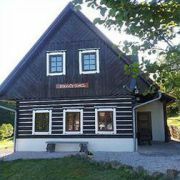 We offer modern cottage between the Bohemian Paradise and Giant Mountains, in the picturesque village Stupna. The … More » cottage is located on a sunny slope near the wood. There are many possibilities for walking and cycling. In winter skiing. The area is rich in natural and cultural attractions.